10 AMAZING FACTS ABOUT INDIA'S RICHEST FAMILY 'THE AMBANI FAMILY' !! 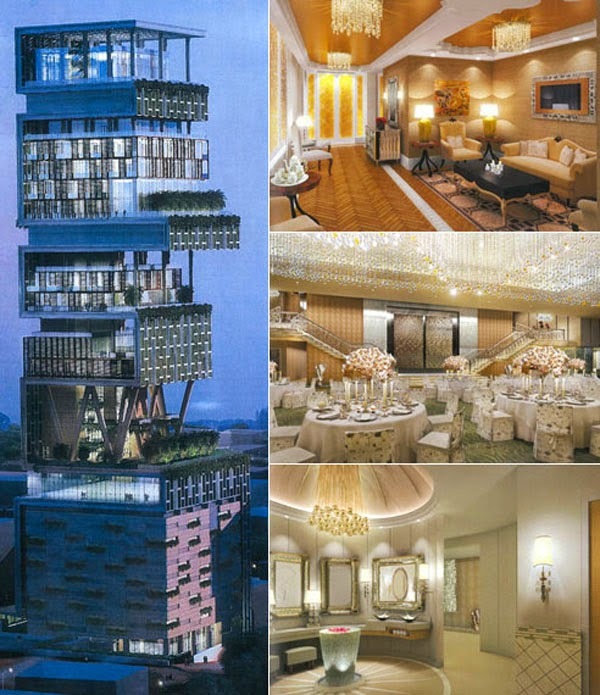 Antilia was built in downtown Mumbai, a city that is known for its exceptional poverty. The 60-storey house has a garage for 168 cars, an independent health club for each family member, a cinema and a staff of 600 people. Anant Ambani, the 17-year old son of India’s richest man, is exceptionally spiritual. Numerous reports state that Anant Ambani is visiting the Lord Balaji temple as frequently, as possible. To prove his faith, the affluent teenager decided to make a special donation for the temple. Anant Ambani ended up providing a sacred white elephant as a special present to Lord Balaji. In 2009, Nita and Mukesh Ambani celebrated 25 years of marriage. Mukesh has often stated in interviews that his family is of exceptional importance. No matter how busy his schedule is, Mukesh spends Sundays with his mother, wife and children. The manner in which the Ambani family is decorated is also strongly evident of the family ties. A family photo or a photo of Mukesh Ambani’s father is available in each of the house’s rooms. On the other hand, Mukesh loves showering family members with love and affection. On the occasion of one of her birthdays, Nita Ambani received a jet plane worth 62 million dollars. India’s richest man has one brother, Anil. Anil Ambani is one of the other wealthiest individuals in India. Prior to their father’s death, the two brothers worked together. They eventually entered a dispute about the company, which led to the separation of their business activities. Word is that they have crushed their problems and have found some sort of middle ground once again. Nita Ambani is involved in a number of philanthropic activities and charity projects. The areas that she is mostly active in include disaster relief, education and proper human resources management. Nita had always wanted to be a dancer, but she instead holds degrees in interior design and teaching. Today, she is the chairperson of Dhirubhari Ambani International School. Despite the fact he is the wealthiest individual in India, Mukesh is known for his modest behavior. He enjoys traditional Indian dishes and he is a vegetarian. The family can be spotted in some of the country’s little and less pretentious restaurants that serve traditional cuisine. In addition, Mukesh Ambani has absolutely no knowledge of fashion brands. He says that he is willing to wear anything that feels comfortable. Currently, Isha Ambani is a student at Yale. Her majors are South Asian Studies and Psychology. In 2012, he was included in a list of the most powerful Digital Indians. Harvard Business Review gave Mukesh the fifth spot in a ranking of the best performing CEOs in the world. Akash Ambaniis the family’s oldest son. He is the twin brother of Isha and the elder brother of Anant Ambani. According to numerous reports, Akash has attended the signing of several important Reliance Industries deals. His participation in such affairs is seen as his father’s attempt to get Akash ready for involvement in the family business.